I turned into a Fred pretty quickly by simply adding 2 “horns” to my helmet. 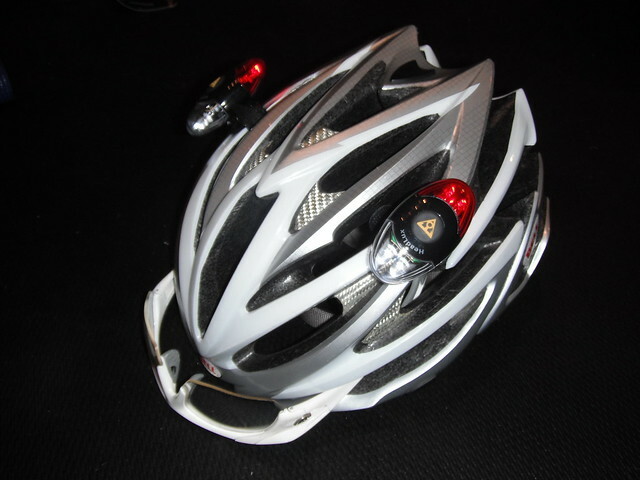 The Topeak HeadLux was appealing because it was a simple way to add front and rear-facing lights to my helmet simply. The mount is pretty simple and mounted without issue. They aren’t overly heavy, but maybe a little noticeable. I prefer rechargeable, but instead they run on 2 pretty commonly available CR2032 batteries. So far, they have been a pretty good setup. The forward-facing light has a nice side-benefit of letting me easily read my Garmin when I look down. My one knock on the HeadLux was that one light was being a little skiddish with a bad connection. I removed the batteries and re-attached the unit and it seemed to solve the problem. As far as visibility, the rear blinkers add a higher view flasher to my normal rear light. The forward facing light is bright enough that as I direct my head, drivers catch the light being shined their way. It may not look PRO, but it does the trick. A good add for my commute riding this winter. Next Next post: The Parlee Went Weeeeeeeeee!